Siberian Huskies have always been a highly sought-after breed of dog. These breeds have been heavily featured in television shows and movies in recent years. As a result, their popularity has only grown. Unfortunately, a lack of knowledge about the breed makes many new owners unprepared for the responsibilities. Many Husky puppies grow up to experience significant health issues due to a lack of proper nutrition. These dogs have unique dietary needs that must be met. Husky puppies grow up into beautiful adults that are athletic and lean. The first year is a crucial age for development. Within a year, Huskies can gain upwards of 40 pounds or more. To get them there, you need to provide your puppy with a high-quality puppy food. Even small discrepancies can lead to lasting effects. Luckily, there are a lot of puppy-specific foods on the market. These options are specifically formulated to fit the needs of your growing Husky. Here's a collection of some of the best dry dog foods for your Husky puppy. 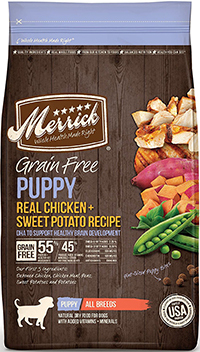 This grain-free formula from Merrick is a great option for your Husky. It's specifically formulated for young dogs. The kibble pieces are small and easy to chew. It contains approximately 28% protein, which is more than enough to make sure that your pup's muscles are developing properly. Most of that protein comes from deboned chicken. The recipe also contains DHA for enhanced brain and eye health. It has the perfect calcium and phosphorous ratio as well. To ensure that your dog is getting all the vitamins and nutrients they need, Merrick included a wide variety of fruits and vegetables. The kibble has apples, blueberries, alfalfa, and much more. 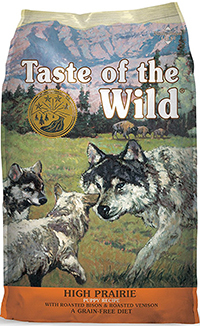 If you're looking for a dog food that can provide your pup with a rich amino acid profile, take a look at this kibble from Taste of the Wild. It has bison and venison for the main protein source. This is accompanied by high-quality antioxidants. Ingredients like sweet potato, peas, raspberries, and more work to strengthen your puppy's immune system. The kibble also has probiotics and prebiotics. The food introduces beneficial bacteria into your dog's gut so that they can properly digest food. 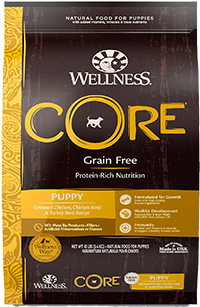 All-natural ingredients are used in this Wellness Core puppy food. You won't find any grains are harmful artificial additives. Every ingredient is included to benefit your pup. Deboned chicken is used for protein. It's accompanied by chicken meal and turkey meal. In total, these proteins make up an impressive 36% of the formula. A healthy collection of plant-based ingredients are also added. You'll find banana, spinach, kale, and more. There are even carrots for beta-carotene. 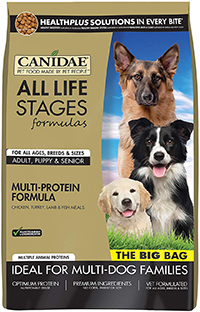 This dry dog food can be used throughout your dog's life. It's formulated to provide nutritional support during every life stage. Premium ingredients are used. It's free of artificial additives and doesn't contain harmful fillers like corn, wheat, or soy. Instead, you'll find things like flaxseed, peas, and beta-carotene. To give your puppy plenty of protein, numerous sources are used. The recipe includes chicken meal, turkey meal, lamb meal, and ocean fish meal. In total, protein makes up 24% of the kibble. The puppy formula from Blue Buffalo contains unique LifeSource Bits. These small morsels are mixed in with the kibble. They're densely packed with antioxidants, vitamins, and minerals to ensure that your puppy is getting all the fuel they need to grow. Deboned chicken is the primary protein source. It makes up 36% of the recipe. It also has the right amount of calcium and phosphorus for healthy bone development. Omega fatty acids are also added to support your dog's skin, fur, and brain. 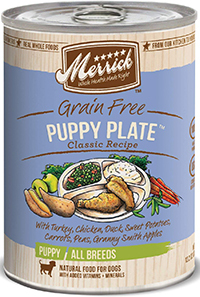 If you want to feed your puppy wet food, this canned option from Merrick may be for you. The first and most prominent ingredient is deboned turkey. Duck is also included as a protein source. Additional ingredients like carrots and apples are added. They provide beneficial vitamins and minerals. There's also flaxseed oil for omega fatty acids. The dog food is soft and contains visible food chunks that are easy to identify. The softer texture is easy for younger pups to consume right after they've been weaned off their mother's milk. Why Do Siberian Husky Puppies Need a Special Formula? 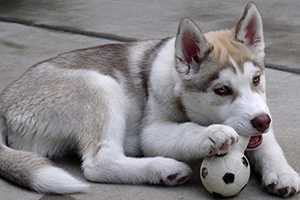 While your Husky puppy may be small, they need a lot more food than you might expect. Compared to their weight, puppies require much more calories than adults do. This is because their bodies are rapidly growing. Their bones and organs are going through a fast growth cycle. Food is the fuel that's used to keep up with that demand. In addition to needing more food, a balanced diet for a Husky puppy is much different than adults. They need more protein, adequate levels of calcium, and plenty of vitamins. Without all of these nutrients, your puppy may become malnourished. This can happen even if you're feeding your puppy the right amount of food. Cheaper foods that aren't designed for young pups don't have the nutritional content they require. This can lead to improper development. While some problems are evident after only a couple weeks, others take years to make themselves known. That's why it's so important that you take the time to select your puppy's food. Huskies are also very unique when compared to other breeds. They were originally bred to survive harsh Arctic climates. They had very little access to fresh food. To survive, they had to adapt to their surroundings and make the food that they did get last. While many athletic dogs have fast metabolisms, Huskies are the complete opposite. They burn calories slower. This can lead to excessive weight gain if you're not careful. You'll need to keep a watchful eye on your pup to make sure that they're growing up in a healthy manner. When you browse your local pet store's food supply, you'll be met with many options for puppies. It's important to remember that Huskies are unique. You'll need to comb through the ingredient lists and look out for these important features. Every dog needs protein. It should be the foundation of their diet. Husky puppies should be fed a diet that contains at least 22% protein. However, it's recommended that you find a formula with around 25%. The protein will help to develop the strong leg muscles these dogs use to run. While adult huskies fair well with very high levels of protein, it's important that you don't provide your puppy with too much. Excess protein can cause their muscles to grow faster than the rest of their body, which can lead to significant skeletal problems. You should stick with high-quality protein sources like chicken, lamb, beef, or fish. Avoid by-products and meats that don't have an identified source. Meat meals are also adequate. Omega fatty acids are found in fish oil and flaxseed oil. These beneficial fats do a lot to help your puppy out. They can enhance cardiovascular health with regular consumption. For Huskies, these fats help to keep the skin and coat supple. Huskies have a thick coat of fur that sheds regularly. They're susceptible to a variety of skin conditions. Their skin can become red, itchy, and swollen. * This can eventually lead to hair loss. Omega fatty acids will help your pup avoid these issues. DHA is a specific omega fatty acid that's known to support brain and eye health. Huskies are at risk for eye problems and vision loss. It may affect your puppy early on. While DHA can't prevent these problems completely, it may be able to decrease the severity and keep symptoms under control. Calcium and Phosphorous are crucial minerals that support bone health. During the puppy years, your dog will need a specific amount of these minerals to stay healthy. The magic ratio is about 1.2:1. For every one part of phosphorus the food contains, it needs 1.2 parts of calcium. These minerals can be tricky to regulate. Too much can lead to growth discrepancies in their body. However, too little can result in skeletal problems. A healthy collection of plant-based ingredients can do wonders for your puppy's health. Fruits and vegetables contain many essential vitamins and nutrients. Some also contain healthy extras. For example, antioxidants in apples and blueberries can strengthen your pup's immune system. The beta-carotene found in carrots can also improve ocular health. Younger pups don't have the strong gastrointestinal tract that older dogs do. They may experience stomach issues as a result. To strengthen their system, you can get a food with probiotics. Probiotics are healthy bacteria that thrive in the gut. They aid the digestive process and make sure that your dog's food is absorbed properly. Huskies tend to self-regulate their weight, even as puppies. They're not like other dogs that will eat every ounce of food you put in front of them. They'll often skip meals if they weren't as active during the day. This can put a wrench in their development cycle. You can avoid any serious issues by going with a food that's nutritionally dense. Dense foods have more calories per piece. Your dog can eat less food but still get the nutrition that they require. The Association of American Feed Controls Official is an organization that sets guidelines and regulations on animal food products. A commercially available dog food cannot have their stamp of approval unless it meets those guidelines. The organization has guidelines set up for large breed puppies. To make sure that a dog food is a healthy option, look for that seal on any puppy food that you're interested in. 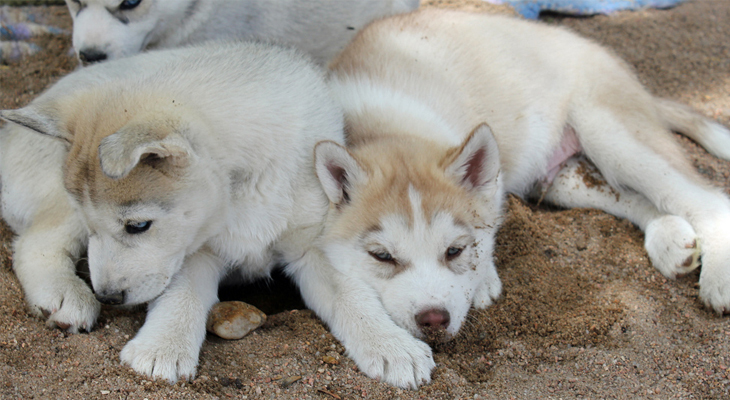 Husky puppies should be put on a high-quality kibble once they wean off their mother's milk. Typically, this is after a few weeks of age. During the first month or so, you may need to moisten the food with water so that your pup can eat it safely. It's a good idea to feed your puppy multiple meals throughout the day. You should start with four meals every day and slowly work your way down to two meals over the course of nine months. You'll need to continue feeding them puppy food until they reach full adulthood. This can occur anywhere between 12 months of age up to 18 months of age. It all depends on how your puppy grows. If you're not sure when they reach that threshold, continue with the puppy food until 18 months. It's always better to continue feeding them puppy food than to make the switch to an adult formula before they're ready. Despite their beauty and athleticism, Huskies can experience many different health issues throughout their lives. Many of these problems are genetic. Others are directly affected by how they grew up. You can use food to your advantage when combating these problems. A high-quality diet may help to put these problems off as long as possible. Huskies are known for their visually striking eyes. The piercing blue color is what attracts many owners. Often times, Huskies even have heterochromia, a genetic condition that results in two different colored eyes. Unfortunately, eye problems are far too common with this breed. They can experience cataracts, glaucoma, retinal atrophy, and corneal dystrophy. Many of these problems can't be avoided. However, you can do your part to keep your puppy's eyes as healthy as possible. Beta-carotene in foods is converted to retinol, which helps to keep the eyes healthy. You can find beta-carotene in carrots, sweet potatoes, pumpkins, and virtually any orange-colored food. Hip dysplasia occurs when the joints become malformed. It can be caused by improper development. Dogs with this condition experience immense pain in their hips. It can cause your pup to walk strangely. It usually affects Huskies in the middle of their life. Unfortunately, it can get worse with time. To avoid it, you'll need to make sure that your dog is growing at a healthy pace. Their diet should contain adequate levels of calcium and phosphorous. If your pup is already suffering from hip dysplasia, you may be able to control pain with a healthy dose of glucosamine and chondroitin. This issue is very common with Huskies. Zinc is a mineral that's found in many foods. If your puppy is not getting enough, they may experience hair loss on various parts of their body. It's important that you consult with your vet before making any serious dietary changes. While zinc is essential for staying healthy, too much of it can also lead to health problems. Husky puppies are a joy to raise. Their distinct personalities make them an unpredictable breed. As an owner, it's your responsibility to make sure that your puppy has all the fuel they need to thrive. 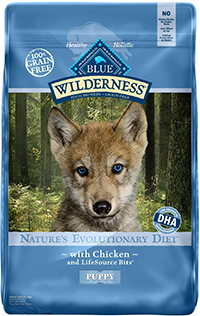 With a high-quality puppy food, your Husky can grow up to be a happy and healthy adult.